UNE 29TH every year is the date on which we celebrate Ss. Peter & Paul. Because this is such an important solemnity, even this year, when the 29th of June falls on a Sunday, we still celebrate the Mass in their honor. Peter and Paul are two of the greatest saints we lay claim to in our heritage. They were also two of the greatest sinners. Peter was supposed to be the “rock” upon which Jesus built His Church. But he is the one who denied Jesus three times during His Passion. With all his impetuosity, Peter turned out to be one of the shakiest “rocks” Christ could have chosen to be the foundation for the Church. Similarly, Paul had been one of the strongest persecutors of Christianity. In his Letter to the Galatians, he describes his “former way of life”: “I persecuted the Church of God beyond measure and tried to destroy her” (Galatians 1:13). Prior to his conversion, Saul was one of the most influential and horrible opponents the Church has ever faced. 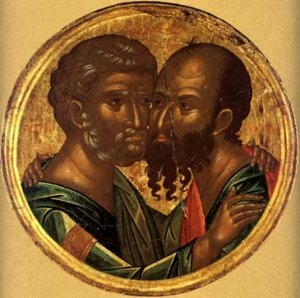 So how did Peter & Paul become so central to our Church? How did they become saints? Paul, himself, gives us the answer in his Second Letter to Timothy. He writes: “The Lord stood by me and gave me strength, so that through me the proclamation might be completed” (2 Timothy 4:17). What a consoling thought! This is the secret to becoming a saint: be strong with God’s strength, rather than your own. Our own strength is necessarily limited; the strength of God, however, is limitless. We do well to remember that every saint (save for the Blessed Mother) is, first and foremost, a sinner. Peter & Paul would have appeared as clearly weak men to anyone who knew them. Peter could only become the rock because Christ had been the cornerstone before him. Paul could only become a great preacher because Jesus was the Word he preached. When they were imprisoned, when Paul was shipwrecked, when Peter hung upon his own cross of crucifixion, the Lord “stood by” them all along. Although they were weak sinners, Peter & Paul, by their lives and by their martyrdom, bring us Good News. The Good News is that—for all of us who are weak—there’s hope. The Lord stands by us, and He can make us saints, too.